The first 2 matches started slowly but once the ball was rolling finishing the 12 matches for the day came as the breeze that kept the SIFF Academy football field at a manageable temperature for the games. The only issue the organizers had to deal with was the eagerness of the teams to play. Even the break between the first and second rounds was not observed as the teams lined up to finish up their matches for the day. 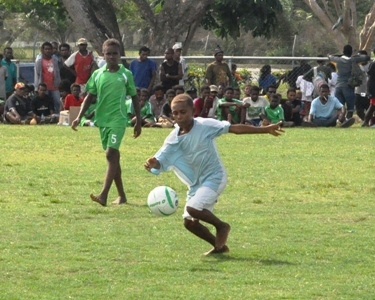 St. John Primary School of Honiara registered the biggest score line of the day beating Vanua of Rennel and Bellona by 4 – 1. The youngsters of Vanua put up a respectable fight but St. John was too experienced and too fast for them to deal with. The second biggest score line of Day 1 was Gwaigeo’s 3 – 0 win over Poitete of Western Province. Overall the performance from Day 1 was fairly evenly matched with 4 out of 12 matches ending in 0 – 0 draws while 3 finished close at 1 – 0. Statistics aside the performance of the teams was commendable with each team having their own top player who claims much of the limelight. The difference between the Honiara teams and the provincial sides was not apparent at all, except of course aforementioned win over Vanua. The Malaita schools are the ones that are appear to be favourites after Day 1 with their confident football and pace over the other sides. More football is expected tomorrow as the teams go head to determine who will proceed to the knockout stages and win the kids festival trophy.